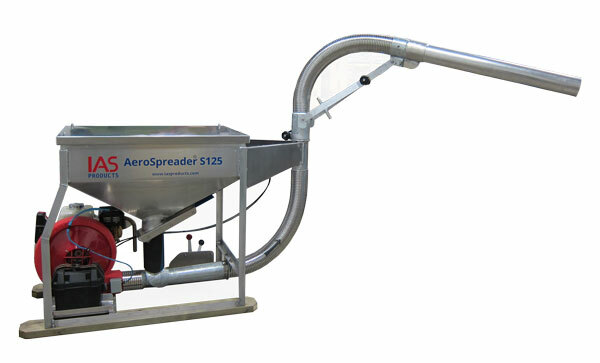 This compact-sized stationary or mobile feed pellet blower offers feed broadcast rates and distances commonly found in our larger mid-range AeroSpreader™ S250 model feed broadcaster but is sized to address the mobility attributes found with our most popular AeroSpreader™ S80. 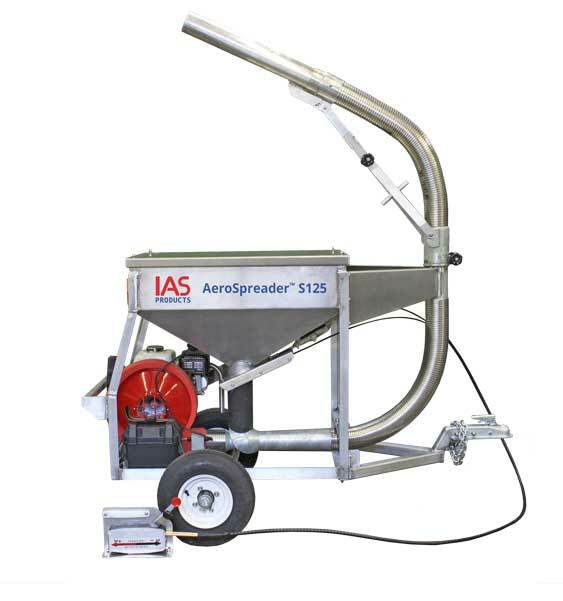 While ideally sized for broadcasting dry feed pellets for both smolt and grow out fish applications, the AeroSpreader™ S125 is equally at home broadcasting and evenly distributing any dry pellet or granular type medium. 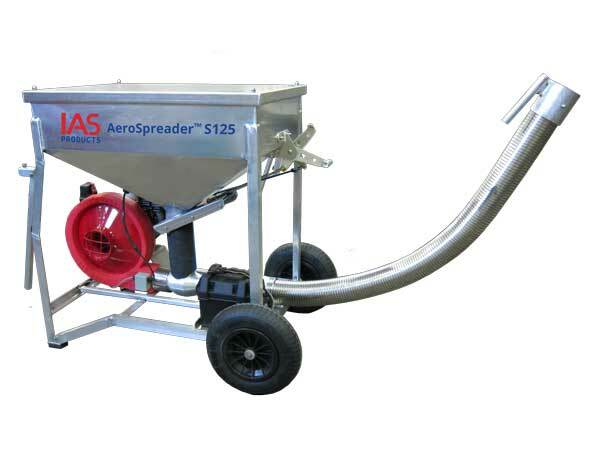 Due to the small 125 kilo/275 lb hopper capacity, this AeroSpreader™ S125 model feeder is most often chosen for operations where small quantities of large sized feed pellets are required to be broadcast to greater distances than found with the AeroSpreader™ S80. All AeroSpreader™ feeders provide improved feed conversion ratios by accurately and consistently placing dry feed pellets wherever required. Air blower feeders maximize labour efficiency by eliminating operator downtime due to repetitive arm and shoulder injuries while at the same time better applying operator skills on the monitoring of underwater feed cameras for best pellet placement, feed delivery rates, and fish behavior. All are important steps needed to reduce production costs and improve feed conversion rates. The marine grade aluminum broadcaster is designed with a low hopper height ideally suited for the repetitive lifting and loading of small-bagged feeds. Both mobile and stationary models offer a low center of gravity making the AeroSpreader™ S125 ideal for moving around on narrow walkways, positioning in restricted areas, or mounting on vehicles or trailers. Options include remote cable controls for blower speed and feed rate control as well as a range of nozzle outlet configurations. 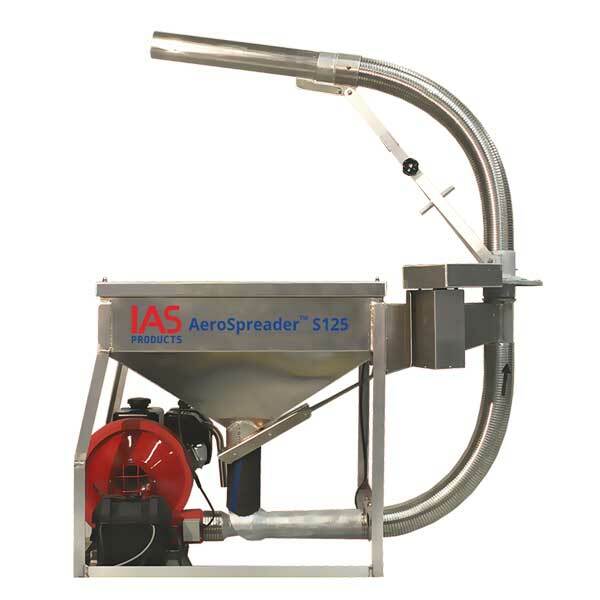 AeroSpreader™ S125 model feed broadcasters are matched with a reliable 6.5 hp Honda® motor (optional electric motor available) that direct drives an Aerite™ AB135 model blower providing the energy necessary to broadcast feed pellets from 2.0 mm to 9.0 mm through a 4-inch diameter stainless steel flex hose. The handheld broadcast hose offers full operator feed control of feed pellet placement as needed to minimize fish feed competition and ensure maximum growth. Some optional accessories include Gull Wing Deflector, Manual Periscope Feed Head™, and Extended Cable Controls for truck/ATV/boat mounted feeder. An all stainless steel feed broadcast hose with a smooth inner liner maximizes feed broadcast hose operating life and feed pellet broadcast distances. Tough marine grade aluminum hopper will not rust. Ideal for narrow walkways and easy boat or vehicle positioning. Self-contained power pack fitted to a compact sized, lightweight feeder ensures quick set up and operation practically anywhere. A direct drive Aerite™ AB135 model blower requires no belt/pulley adjustments. Internal feeder surfaces and edges designed to ensure no feed pellet remains trapped and no pellet is damaged or broken during the feed pellet broadcasting process. Matched air inlet and impeller design reduce fuel-operating costs while delivering high scfm air delivery rates at lowest possible sound levels. Camera cart and cameras ideal for on-the-spot monitoring of cables, anchors, buoys, nets and other structures around the site. Large air volume air plenum for high volume feed delivery rates and broadcast coverage. Two moving parts ensure easy operator maintenance and repair and best reliability. 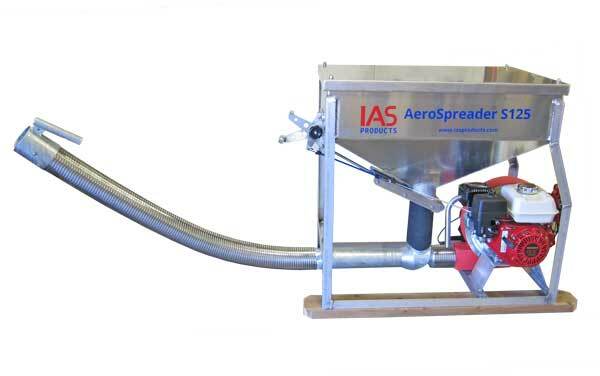 IAS proprietary designed eductor eliminates feed damage. 37 kg maximum (81.5 lb) per minute for 9mm feed pellets. Note that feed delivery rates increase as feed pellet sizes decrease. Marine grade aluminum, galvanized steel and stainless steel hardware. 4.8 Kw (6.5HP) gasoline powered Honda motor with low oil alert. Copyright © 2017 IAS Products Ltd.